WASHINGTON—Lawmakers reached a deal on Jan. 22 to reopen the government just three days after Democrats forced a shutdown over illegal immigration. Congress voted to extend funding through Feb. 8, which is the new deadline for both parties to reach an agreement on government spending levels and find a permanent solution for illegal immigrants who came into the country as children. 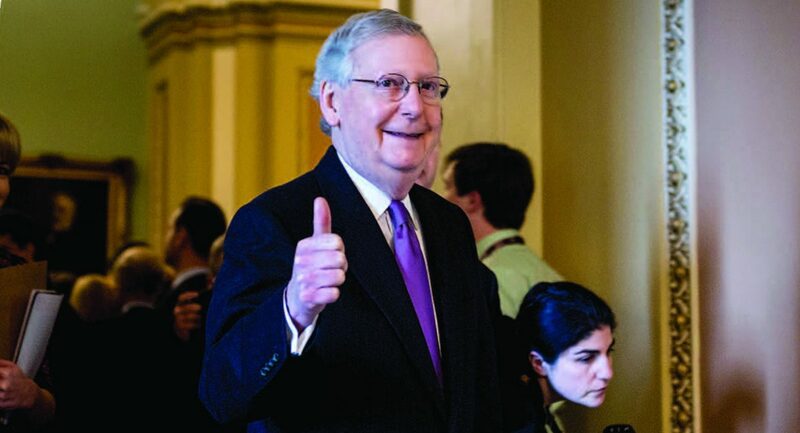 Senate Majority Leader Mitch McConnell (R-Ky.) called the shutdown a “regrettable episode.” It “reminded all of us that in the United States Senate brinkmanship and hostage-taking simply do not work,” he said from the Senate floor on Jan. 23. Over the next few weeks, there will be “serious negotiations” on a variety of issues, he said, including immigration and border security, defense spending, disaster relief, and health care. As a precondition for supporting a budget deal, Democrats are pushing for a legislative solution for nearly 700,000 recipients of the 2012 Deferred Action for Childhood Arrivals (DACA) program. In return for granting legal status to DACA recipients, Trump demands “responsible immigration reform,” separate from a budget deal. He calls for a wall to be built along the U.S.–Mexico border, as well as an end to the chain-migration system and the diversity visa lottery. The government shutdown came after negotiations between Republicans and Democrats failed over DACA and border security. Hours before the deadline on Jan. 19, Senate Democrats blocked the passage of a short-term funding bill, known as a continuing resolution (CR), that aimed to maintain current funding for federal operations and keep the government open. Republican and Democratic leaders spent the weekend criticizing each other and trading blame for the shutdown. 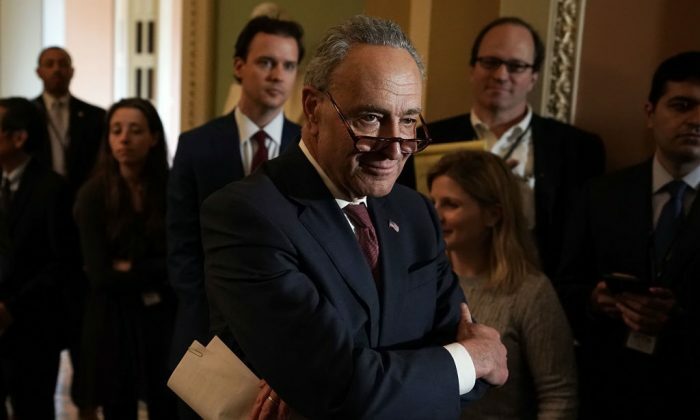 Democrats labeled it the “Trump shutdown,” while Republicans called it the “Schumer shutdown,” referring to Senate Minority Leader Chuck Schumer (D-N.Y.). “Democrats are far more concerned with Illegal Immigrants than they are with our great Military or Safety at our dangerous Southern Border,” Trump wrote on Twitter on Jan. 20. Schumer, meanwhile, blamed Trump. “President Trump’s unwillingness to compromise caused the Trump shutdown,” he said. Schumer also said most Democrats were against the wall. According to critics, Democrats tried to use the shutdown as a tactic to pressure Republicans into hammering out a permanent deal for DACA recipients. The tactic, however, was a political gamble that backfired on the Democrats. Media reports portrayed the government shutdown as a big loss for Schumer and the Democrats. Democrats had to end a three-day standoff after Republicans assured them the Senate would consider immigration legislation in the coming weeks. Both parties voted on a continuing resolution that keeps the government open through Feb. 8. Democrats are far more concerned with Illegal Immigrants than they are with our great Military or Safety at our dangerous Southern Border. The continuing resolution also includes a six-year funding solution for the CHIP, which provides relief to 9 million children who rely on the program. Congress now has a few weeks to reach a deal on DACA legislation. President Barack Obama introduced DACA through an executive order in 2012, after Congress failed to pass the Development, Relief, and Education for Alien Minors (DREAM) Act. DACA was a temporary measure that gave recipients renewable, two-year work authorization and deportation immunity. Trump announced his plan to end the program last October and asked Congress to find a permanent solution by March 5. “Nobody knows for sure that the Republicans & Democrats will be able to reach a deal on DACA by February 8,” wrote Trump on Twitter on Jan. 23. Both parties agree that they want to spend more than what the current law allows. The last budget deal, signed two years ago by Obama, ended in September, causing the automatic spending caps to take effect. In order to increase spending, Congress must reach a deal to raise budget caps. Republicans want to boost military spending, while providing a much lower increase for non-defense accounts. Democrats, by contrast, demand parity between defense and nondefense spending. Trump signed a $700 billion defense bill, the National Defense Authorization Act (NDAA) for fiscal 2018 in December last year. Both houses of Congress passed the bill with strong bipartisan support. The NDAA authorizes a nearly $626 billion base budget, which exceeds the $549 billion spending cap that’s currently in place under the 2011 Budget Control Act. The NDAA aims to expand the size of the U.S. armed forces for the first time in seven years. In addition to the base budget, the defense bill authorizes roughly $66 billion for special war funding, also known as Overseas Contingency Operations (OCO) funding. The OCO fund is used in military operations against terrorist groups, including ISIS. Defense has suffered a disproportionate share of spending cuts in previous years, as a result of automatic cuts to federal government spending, known as sequestration. To meet the defense-spending target, Congress needs a budget deal to lift the statutory cap. According to Democratic leaders, a deal can be reached if the budget protects the principle of parity and increases defense and nondefense funding by equal amounts. They claim that nearly a third of domestic budget includes spending for Homeland Security, anti-terrorism activities of the Justice Department, Veterans Affairs, and the State Department—items they say are essential for national security. Demand for parity is a key hurdle in budget talks, since Trump wants to offset the increase in defense spending by cuts to domestic programs. The spending bill needs 60 votes to pass the Senate, and Republicans hold only 51 seats. Congress needs to race the clock to solve the DACA challenge and reach a bipartisan deal before the Feb. 8 deadline. It remains to be seen whether they can achieve it, this time around.